Abstract: Scanning laser ophthalmoscopy (SLO) and optical coherence tomography (OCT) provide information on cellular and sub-cellular structures in the living eye when enhanced with adaptive optics (AO) capabilities. AO enhances transverse resolution and confocal sectioning capabilities by detecting and correcting ocular aberrations in real-time and has become a valuable tool for vision researchers to explore the structural and functional aspects of vision and its disruption by disease. While AO has yet to fully transition from research lab to clinic, OCT is now a standard diagnostic procedure for glaucoma, macular holes, macula edema, retinal detachments, and other retinal pathologies. Simultaneous use of the two complementary imaging modalities provides a powerful comprehensive modality to investigate the eye. AO systems use a wave-front sensor to sense ocular aberrations that arise primarily from the cornea, crystalline lens, and tear film, and correct them using a deformable mirror in a closed-loop manner. AO has recently achieved success in a range of applications in ophthalmology in which the building blocks of retinal microstructures such as cone photoreceptors, rods, RPE cells, blood cells, and microvasculature need to be identified, counted, and mapped properly. In this presentation we will review the state-of-the-art capabilities in high-resolution retinal imaging. PSI designed, developed, and tested a number of compact platforms combining the power of AO with SLO or line-scanning technology (LSO), and OCT for human and animal eye imaging. Our compact, simplified research instruments can be used by ophthalmologists, optometrists, and vision scientists and will facilitate the introduction of this technology and the development of new techniques to detect and treat retinal diseases. Although AO-enhanced confocal SLO enables high-resolution imaging of the eye fundus, the capillaries are essentially transparent and, in standard, bright-field AO imaging can be difficult to visualize, except for the specular glint from blood cells coursing through them or the shadow they cast on deeper layers. Recently, it was shown that by using a larger, offset pinhole in the AO detection unit, images that capture multiply scattered light (as opposed to direct backscatter) can reveal the tiny retinal vasculature network of the human retina with unprecedented clarity. Offset aperture/split detector/quad simultaneous imaging modalities will also be presented as the most recent developments in high-resolution retinal imaging. 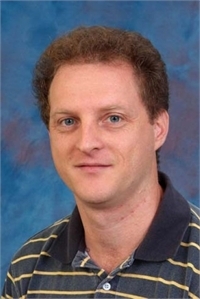 Biography: Mircea Mujat obtained his Ph.D. in Optics in 2004 under the supervision of Prof. Aristide Dogariu at the School of Optics/CREOL, University of Central Florida. As a graduate student, he developed theoretical models and experimental techniques for polarimet¬ric characterization of random electromagnetic fields, and for analyzing the signature of various random media. Between 2004 and 2007 Mircea joined Harvard Medical School and Wellman Center for Photomedicine - MGH as a Research Fellow, working with Prof. Johannes de Boer on ophthalmic investigations using OCT. He then joined the Biomedical Optics Group at PSI. His research interests at PSI are in ophthalmic imaging, medical instrumentation, adaptive optics, optical coherence tomography, and polarization imaging. Mircea is a member of the OSA, SPIE and ARVO.